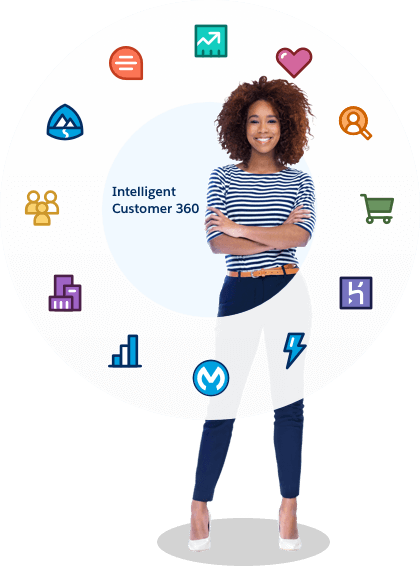 Connect to your customers in a whole new way with the world’s #1 CRM platform. Explore the Customer Success Platform. Give your sales teams the power to close deals like never before with Sales Cloud, the world’s #1 CRM solution. Increase productivity, fill pipeline with solid leads, and score more wins without software, hardware, or speed limits. Hand your sales team their next win with predictive scoring, actionable insights, intelligent automation, and more accurate forecasting. Enhance your customer support — from call-center software to self-service portals — with Service Cloud. Get more responsive, intuitive, and flexible service solutions that help you anticipate your customers’ needs. Connect your entire workforce to deliver intelligent and productive onsite service, and transform the customer experience in the field. Deliver personalized customer journeys powered by the intelligent marketing platform for email, mobile, social, digital advertising, and DMP. Build 1-to-1 customer journeys with Marketing Cloud, the world’s most powerful digital marketing platform. Capture, unify, and activate your data to build valuable customer experiences. Build better customer experiences and crush conversion rates with Commerce Cloud, the world’s leading ecommerce platform. Convert shoppers anytime, anywhere, on any device. Create engaging, personalized shopping experiences that connect across mobile, social, web, and even your store. Offer business buyers the seamless, self-service experience of online shopping with all the B2B functionality they demand. Build custom apps connected to Salesforce, and get your apps to market faster, with Heroku cloud services and developer experience. Extend your sales and service capabilities with the world’s #1 CRM platform. Streamline, automate, and mobilize any business process using third-party apps or custom apps that you build yourself. Easily create social and mobile apps using lightning-fast tools that let anyone build with either clicks or code. Build scalable, trusted apps faster than ever with new enterprise features and native Salesforce data integration. Connect any app, data, or device, whether in the cloud or on-premises, in one place: the MuleSoft Anypoint Platform. And bring data from any system, like SAP, Oracle, Workday, and more, directly into Salesforce. Make more intelligent, data-driven decisions that guide your business forward with Einstein Analytics. Artificial intelligence has simplified the entire analytics workflow, taking you from data to insight to action in minutes. Find tailored solutions designed to meet the specific needs of your industry and transform every aspect of your business with Salesforce, the world’s #1 CRM platform. Grow your book of business, supercharge advisor productivity, and deliver personalized advice anywhere, on any device, with the world’s #1 CRM solution, reimagined for financial services. Get a complete view of the patient, deliver insightful care, and connect with patients anywhere, on any device — it’s about patient relationships, not records. Find charitable opportunities, enable employee volunteering, request matching donations, and get an at a glance view of your company’s progress toward philanthropy goals. With Community Cloud, create beautiful, CRM-powered experiences — fast. Use templates to quickly launch pre-built use-case-specific solutions for your customers and partners. Or start with partner-built industry-specific solutions and components. Create branded, pixel-perfect sites, portals and forums for any audience. Use our drag-and-drop builder to add lightning components, create content, and import data and content from Salesforce or any external source. myTrailhead is the world's leading learning experience platform. Scale onboarding, supercharge productivity, increase Salesforce adoption, and cultivate company culture. Create collaborative documents, spreadsheets, live apps, and slides with Quip. Embed live Salesforce data that automatically updates so you never have to worry that it’s out of date. Salesforce, the world’s #1 CRM platform, gives you CRM solutions that help you generate more leads, increase sales, discover business process efficiencies, improve customer satisfaction, and collaborate better together. Our CRM products use proven leading-edge technology, like mobile apps and Salesforce Success Cloud, to save time and resources, reveal revenue opportunities, and provide critical information and tasks on demand when and where you need them. On average, Salesforce CRM customers enjoy: 37% more sales, 44% increased leads, and 45% higher customer retention. Salesforce offers CRM solutions for businesses and organizations of all sizes, from small to midsize to enterprise, and for any industry. If your business has employees, customers, and prospects, Salesforce can help. Marketing Automation: Build intelligent, data-driven programs that generate new leads and speed up your sales cycle. Marketing Automation: Automate your marketing and sales engagement to generate more leads, close more deals, and better measure marketing success. Enhance Customer Interactions: Identify trends and opportunities to maximize every customer interaction with Desk.com.